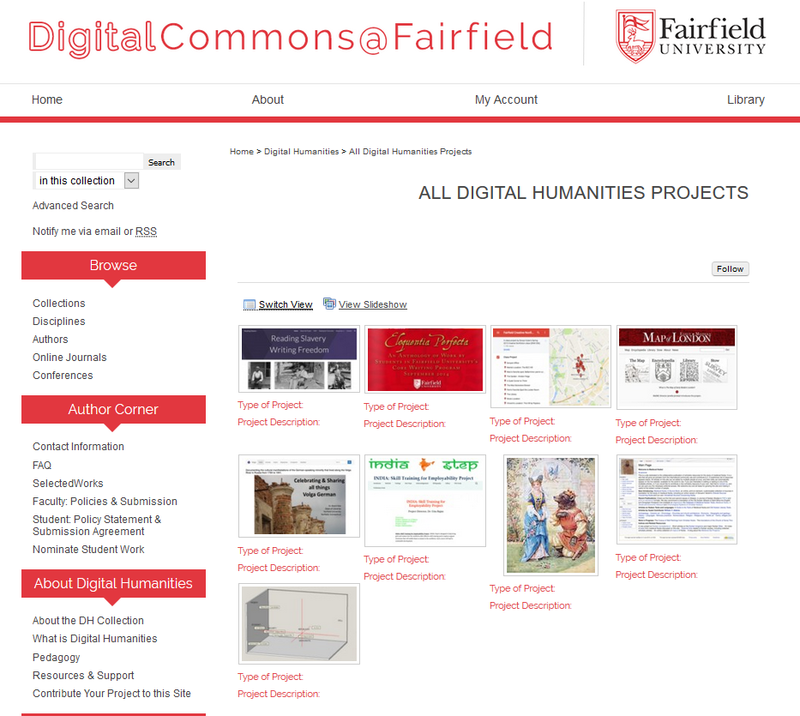 Have you visited Fairfield University’s institutional repository, DigitalCommons@Fairfield? For those unfamiliar with term, an institutional repository (or IR) is an open access digital collection of scholarship created by members of an institution. Our repository archives digital copies of books, book contributions, articles, book reviews, patents, digital scholarship projects, videos, and more, all authored by members of the Fairfield University community. If you haven’t yet participated in DigitalCommons@Fairfield, what are you waiting for? Faculty – all you have to do is send your CV to the DigitalCommons@Fairfield team (Nina Peri and Hayley Battaglia) at digitalcommons@fairfield.edu, or fill out the nomination form to suggest outstanding student work for inclusion. First, to consolidate all of the great work done at Fairfield U in one place, so that the repository becomes an archive and showcase for the academic accomplishments of our community. Second, to increase the visibility of Fairfield University scholarship for appreciation by a larger and wider audience. Authors receive monthly download counts that track the global impact of their work. Check out our live readership map to see what Fairfield University works are being read around the world. Everything loaded into DigitalCommons@Fairfield is search engine optimized, so once we add a work to the repository, the DigitalCommons@Fairfield record appears at the top of search results and will be visible and accessible to anyone with an internet connection, which leads into our third goal. 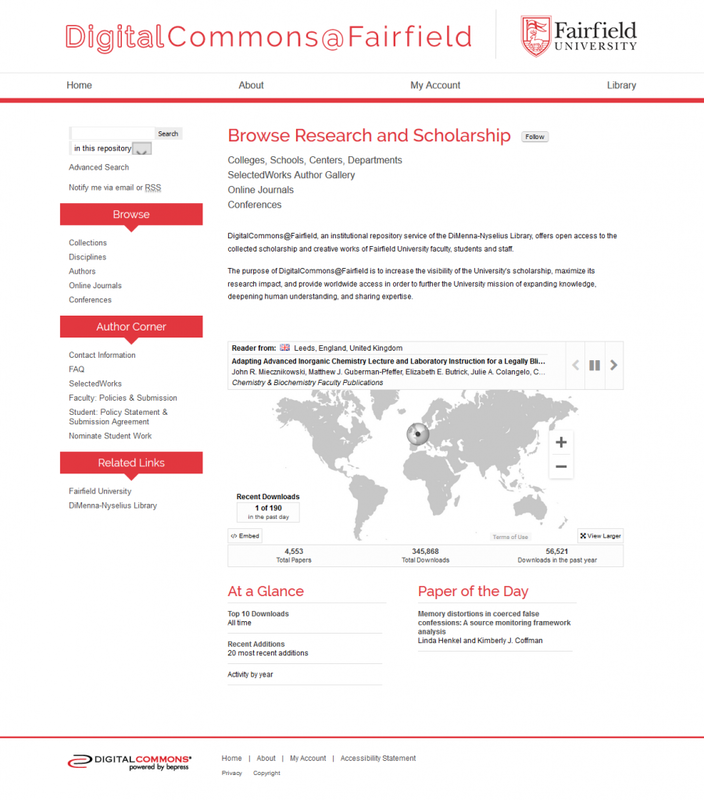 DigitalCommons@Fairfield connects researchers all over the world with scholarship that may be otherwise inaccessible to them. We try to include as much content as possible while abiding by copyright restrictions, requesting permission from publishers to include a work when necessary. DigitalCommons@Fairfield is an Open Access repository—all content in the IR is freely accessible online—which means that researchers unaffiliated with institutions that could provide them with subscribed access (like DiMenna-Nyselius Library) and lacking funds to purchase access to articles themselves will benefit from our repository, furthering the social justice mission of Fairfield University. We’ve created a clean, minimalist design that is easy to navigate and provides a professional, authoritative frame for presentation of faculty and student work. Our new Digital Humanities collection highlights the innovative works of the Humanities departments that make use of digital technologies in their research. The IR is the perfect vehicle to host and disseminate digital scholarship and supports a variety of media formats. Visit What is Digital Humanities and Why Does It Matter to learn more about the field. Up until this year, our IR has only reflected the research and publications of our faculty. We are excited to announce that we are currently accepting faculty nominations of student work. Visit the AUTHOR CORNER in the navigation area on the main page for submission guidelines and nomination form. Collecting and sharing innovative student projects allows us to paint a more holistic picture of the exciting academic landscape at Fairfield University while showcasing student achievement. Faculty nomination ensures quality of student work approved for publication in the Institutional Repository. Opening the IR to students creates an opportunity for learning about the world of academic publishing, including understanding author’s rights, copyright, metadata, usage statistic, etc., which may prove beneficial in future academic and professional careers. 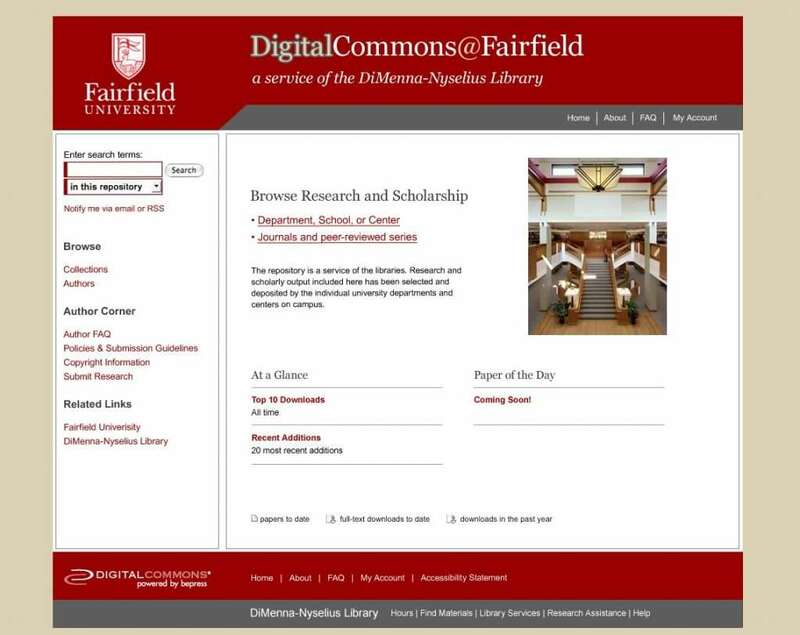 DigitalCommons@Fairfield gathers Fairfield University’s scholarly output and presents it to the world in one easily accessible location. By increasing the visibility of Fairfield University scholarship and providing faculty authors with the means to track global readership, the IR enhances our faculty and students’ participation in scholarly conversation. The repository has grown and improved since its inception in 2011, with an updated aesthetic, expanded pool of contributors, and newly added technologically advanced collections. As a reflection of university scholarship, DigitalCommons@Fairfield will continue its evolution to anticipate and serve your needs, to celebrate and promote your accomplishments, and to bring your work to the screens of anyone with an internet connection. Want to see your work in the repository and start getting monthly download counts? Faculty – all you have to do is send your CV to digitalcommons@fairfield.edu, or fill out the nomination form to suggest outstanding student work for inclusion.